Inspired by a lickable nail polish debuted in Hong Kong earlier this year, Edelman is helping the chicken brand bring scented skin products to the beach. LOUISVILLE, KY: Apparently, lots of people want to smell like fried chicken. Within two hours of launching a free giveaway of 3,000 bottles of KFC's Extra Crispy Sunscreen on Monday morning, all bottles had been claimed. Edelman created the concept, produced the sunscreen, and is leading media relations outreach around the product. Edelman Dallas GM, Chris Manzini, explained the SPF 30 sunscreen is meant to be a limited run. He noted, however, that KFC will likely end up having to produce more bottles to fulfill orders, as the initial 3,000 went so quickly. 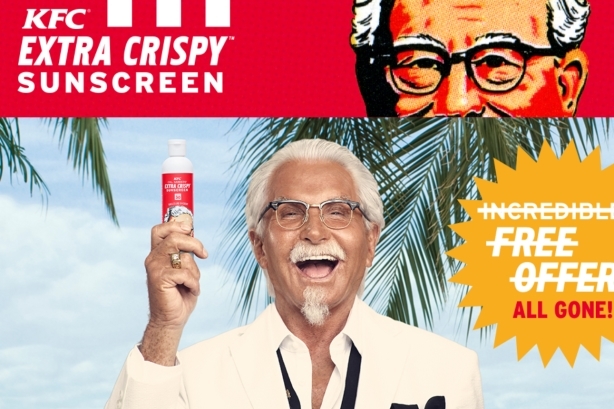 KFC’s U.S. CMO Kevin Hochman explained the sunscreen idea seemed a "natural fit" to align with the brand’s Extra Crispy Colonel campaign, which began in June. It is in-line with KFC’s marketing strategy, which aims to be "unexpected," Hochman said. The campaign is being supported by media relations, social content, and a microsite. The tongue-in-cheek website includes a video featuring the Extra Crispy Colonel, portrayed by actor George Hamilton, an explanation of how the sunscreen works, testimonials, and side effects. "We hand-bread and freshly prepare chicken in our kitchens all day every day, which makes our restaurants smell amazing," he said. "The Extra Crispy Sunscreen that smells like fried chicken is a fun way to leverage that with our fans." With the Extra Crispy Colonel, KFC has been playing off of its chicken’s features, as well as those of the character, in that they are both "extra crispy, golden brown, and tan," explained Manzini. The ads tend to include a beach setting, as well. "It was really connecting consumer insight - people love something physical in their hands and something unexpected," said Manzini. "We wanted to bring the thing people love about KFC so much - which is the delicious smell of its chicken - to life in a product." The inspiration for the sunscreen product came from the success KFC Hong Kong saw in May when it launched lickable, edible fingernail polish in two flavors: Original, and Hot and Spicy. "They were trying to bring finger-licking good to life with the nail polish," said Manzini. "We saw people’s reaction to that and people loved it." During the brainstorming process, Manzini said the idea of a suntan lotion came up, but Edelman initially decided against it because the firm didn’t want KFC to be seen as promoting tanning or being associated with cancer risks. Instead, the sunscreen was created with the tagline: "Protect your skin…with fried chicken!" "We had to be prepared for people to think it smells gross, or say, ‘I don’t like it, this is a silly idea,’" Manzini said. "But it is KFC’s brand to be irreverent – not everyone is going to love everything you do, and that’s OK."
Hochman added that "smell is subjective," and that fans "who know KFC best" will love the product. "It’s said that smell is more successful at triggering memories and emotions than any other sense," said Hochman. "That’s why food evokes such special memories. The smell of KFC brings back great memories to people. We hope this sunscreen will make them hungry for more." KFC fans might see more products like this in the future. "I challenge our teams at Edelman to think of creative ways to bring the brand to life through products and experiences KFC customers can touch, feel, and use," Manzini said. Wieden+Kennedy designed the label, and created the webpage and video message from KFC’s Extra Crispy Colonel. Edelman has been working with KFC as its formal AOR since January, when it ended its relationship with Ketchum subsidiary Emanate, which served as the brand’s consumer and corporate PR AOR in the U.S. since 2012. A few months prior, Edelman parted ways with Chipotle Mexican Grill after a seven-year relationship as the brand’s AOR, due to the conflict with KFC, which it had already started working with. Chipotle has since brought on Burson-Marsteller as its U.S. AOR.